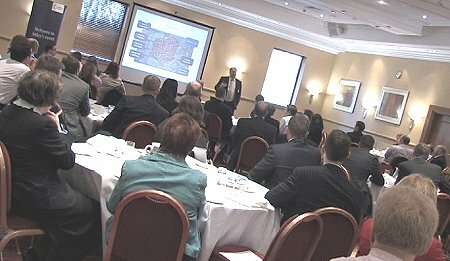 Business people took the opportunity this morning to network and get an update on the new Swindon Wi-Fi project. At an event organised by the Swindon Chamber at the Marriott Hotel, where Rikki Hunt, project leader, spoke on the roll-out plan of the Wi-Fi scheme and the benefits to the business community. ”It's an opportunity to talk about the facts of the project and for people to ask questions on what is a big undertaking," said Mr Hunt, Chief Executive of Digital City, who are delivering the Council-backed initiative. Acknowledging the challenges the scheme had faced during its launch period in Highworth, Mr Hunt added: “Just like mobile phone signal reception, some areas are far better connected than others, but we’re improving coverage ever day.